Early screening for breast cancer, in conjunction with huge advances in the treatment of the disease, have led to a substantial fall in the mortality rate in recent years. The five-year survival rate for localised breast cancer has risen from 80 per cent in the 1950s, to 98 per cent today, according to figures from the American Cancer Society (ACS). The breast cancer market is now well established, with many successful therapies. However, as with all cancers, breast cancer comprises myriad different tumour types, meaning that a definitive cure is unlikely to come in the foreseeable future. The ACS still expects more than 41,000 people to die from the disease in the US in 2006, which places breast cancer as the country's third leading cause of cancer death, behind colon and lung cancers. The society also estimates that one in eight women will be diagnosed with breast cancer during their lifetime. Depending on tumour size and disease stage, current treatment guidelines recommend local removal of the tumour (lumpectomy), mastectomy, radiotherapy, chemotherapy or hormone therapy. The chemotherapeutic options include combinations of cytotoxic drugs, such as cyclophosphamide, epirubicin, 5-fluorouracil, methotrexate, mitomycin, mitozantrone or doxorubicin. The UK's cost-effectiveness watchdog, the National Institute for Health and Clinical Excellence, recommends that post-surgical chemotherapy should include at least epirubicin or doxorubicin. The activity of these drugs is based on their ability to disrupt the growth of cancer cells. Unfortunately, they also affect non-cancerous cells, leading to side effects such as fatigue, nausea, hair loss and bone marrow damage. Hormone therapy is designed to block the production of oestrogen and progestrogen, female hormones that influence the growth of certain types of breast cancer cells. It is usually used after surgery to prevent the return of the tumour, but can be used to shrink tumours before surgery. As these drugs do not have cytotoxic activity, they generally produce fewer side effects than traditional chemotherapy. Tamoxifen has been the leading hormone therapy for many years and has well documented efficacy and few side effects. In recent years, however, aromatase inhibitors, such as Arimidex (anastrazole), and pituitary downregulators, including Zoladex (goserelin), have increased in popularity. Arimidex has been shown, in a large-scale study, to be more effective than tamoxifen, while Zoladex completely shuts down the production of oestrogen in the ovaries. Genentech's Herceptin (trastuzumab) is the first in a new class of antibody-based breast cancer therapies to reach the market. These drugs are designed to target cancer cells specifically, in order to improve efficacy and reduce side effects. While the breast cancer market is split into a wide range of therapies, successful drugs represent a huge opportunity for the pharmaceutical industry. Despite massive generic competition, AstraZeneca (AZ) recorded $114m (Ä89.5m) in tamoxifen sales in 2005. The company's breast cancer franchise also includes Zoladex and Arimidex, which had sales of $1bn (Ä785m) and $1.2bn (Ä943m), respectively, in 2005. Worldwide Herceptin sales totalled $1.65bn (Ä1.29bn) in 2005, and are estimated to reach $1.73bn (Ä1.36bn) in 2008.
Genentech's Herceptin is approved in the EU, US and other territories as a first-line therapy in combination with paclitaxel, and as a single agent in second- and third-line treatment. It has been available in the US since 1999 and in the EU since 2000. 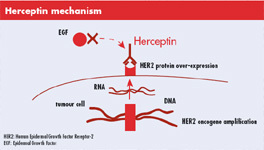 Despite being indicated solely for metastatic breast cancer over-expressing the HER2 protein, Herceptin has been the focus of much media attention in recent months. 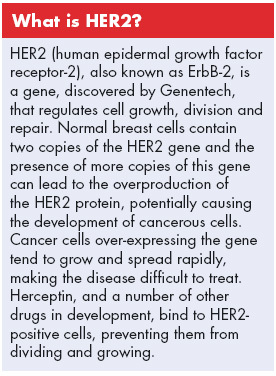 HER2 over-expression is associated with only 25 per cent of metastatic breast cancer incidences, however, these cases are characterised by aggressive tumour growth and a poor prognosis. In phase III trials, a combination of Herceptin and chemotherapy increased median survival to 25.1 months, compared with 20.3 months for chemotherapy alone. Tumour responses were seen in 45 per cent of patients given the combination, compared with just 29 per cent of those given only chemotherapy. What is perhaps most important is that Herceptin has shown benefit in women who have failed to respond to other treatment regimens. In trials testing Herceptin alone in patients who had failed to respond to previous chemotherapy regimens, 14 per cent of subjects experienced tumour shrinkage of at least 50 per cent. Along with its good efficacy, Herceptin originally seemed to bring the added bonus of causing fewer side effects than conventional chemotherapy. The drug's label stated that 40 per cent of patients experienced chills and fever during the first infusion, though these symptoms were less frequent with subsequent drug infusions. However, in a post-marketing study in 2,043 women, the incidence of congestive heart failure was significantly higher in patients receiving Herceptin. The findings led to a warning being added to the drug's label. Subsequent studies confirmed this cardiac risk, but concluded that in most cases the heart damage could be reversed with treatment. This was considered to be an acceptable risk for metastatic breast cancer patients. To help extend the lifetime of its Herceptin franchise, Genentech has started phase I trials of trastuzumab-DM1: Herceptin bound to ImmunoGen's anticancer agent, DM1. This combination has shown promise against Herceptin-resistant cancer strains in preclinical models. German biotechnology group, Fresenius Biotech, has begun phase II trials of Rexomun (ertumaxomab), a multi-functional antibody that targets HER2/neu and CD3. In a phase I trial, 17 patients received the drug with few adverse events. Although this trial was not designed to demonstrate the drug's activity, five patients had an antitumour response, with one patient showing complete remission of lymph node metastases. Two patients had a partial response to the drug and two displayed stable disease. Analysts described these results as encouraging. Phase II data on MicroMet and Serono's antibody, adecatumumab, are scheduled to be reported later in 2006. Adecatumumab targets EpCAM, a protein which is over-expressed in tumour cells. Somanta Pharmaceuticals, a Californian biopharmaceutical specialist, is taking a different approach to the use of antibodies with its Phoenix product. Phoenix uses a radiolabelled monoclonal antibody-targeting polymorphic epithelial mucin to deliver beta-radiation directly into cancer cells. This technique has been used successfully in the non-Hodgkin's lymphoma therapies Zevalin (ibritumomab tiuxetan) and Bexxar (tostitumomab). Phoenix is currently in phase II trials in the US. GlaxoSmithKline's Tykerb (lapatinib) is a once-daily oral drug which blocks both HER2 and EGFR1. Early data from a phase III trial in patients whose disease had not responded to Herceptin showed that time-to-disease progression in patients given a combination of Tykerb and Xeloda (capecitabine) was 36.9 weeks, compared with 19.7 weeks for patients who received Xeloda alone. This combination elicited a response in 22 per cent of patients, compared with a 14 per cent response rate in patients receiving Xeloda monotherapy. Analysts expect the drug to be approved on the strength of these results, which are acknowledged to be promising. Yet, Tykerb is expected to be used only in patients who have not responded to Herceptin, limiting its sales to $80m (Ä62.8m) in 2008, rising to $355m (Ä279m) in 2010. YM Biosciences' tesmilifene is a histamine antagonist in phase III trials, which has been granted fast track status by the FDA for enhancing the activity of anthracycline chemotherapy in the treatment of advanced breast cancer. E-7389, a tubulin inhibitor in development by Eisai, is scheduled to enter phase III trials in advanced or metastatic breast cancer in the near future. The trial will compare survival rates following administration of E-7389 or capecitabine. In a phase II trial, 15 per cent of treatment-refractory subjects responded to treatment with E-7389. A number of companies are investigating the use of vaccines to stimulate the body's immune response to breast cancer cells. GSK's HER2-based vaccine is being evaluated in a phase II trial. In earlier trials, it was well tolerated and induced a dose-dependent response. A HER2-based vaccine being developed by Pharmexa suffered a setback in August 2006, when 10 of 14 patients in a phase II trial displayed tumour progression after treatment. CEO Jakob Schmidt suggested that the patients' disease had progressed before the vaccine was able to work. The firm is assessing its options for the product. Antigen Express' AE-37 also targets HER2 and has been shown, in a phase I trial, to be safe and to induce immune responses. The company expects to begin pivotal trials on completion of the phase I study. Overall, diagnosis rates for breast cancer are high, driving the need for new therapies; any new improvements in efficacy and safety are likely to take a significant market share and generate huge revenue.